NCN is very pleased to end the year with a stunning slide show by photographer Patrick Andrade. 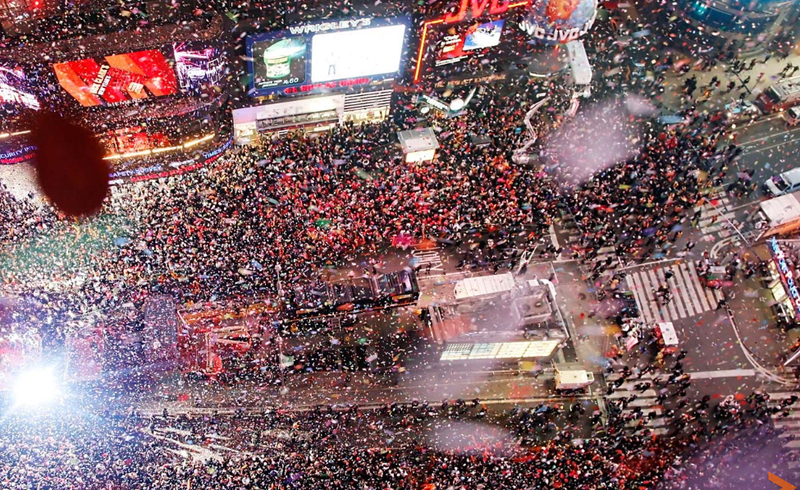 The small island of concrete sidewalk at New York City’s Times Square is most commonly known as “Military Island”. This year the island has witnessed the bombing of a military recruitment station, anti-war and pro-war demonstrations, several promotional events, and the election of a new president. The following photographs were all made during 2008. To see the slide show click on the image below. Earlier this week Hariman commented on how the camera aids our fundamental desire to anthropomorphize animals, to see them “as being like us,” by directing our attention to their eyes—the windows to the soul—which allow a special point of identification and contact between humans. And the evidence is pretty compelling, made all the more so when we consider the obverse, i.e., photographs that underscore the zoomorphic representation of humans as if they were animals. 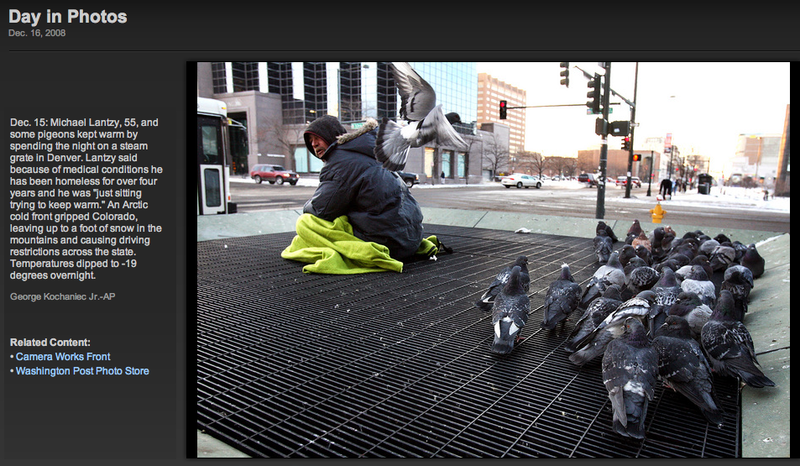 The photograph here is of “Michael Lantzy, 55, and some pigeons kept warm by spending the night on a steam grate in Denver.” According to the caption Lantzy has been homeless for four years, and identifying him by name would seem to distinguish his humanity from the pigeons with which he shares the limited space of public warmth, as does the very physical separation between the lone individual and the clustering flock of birds. 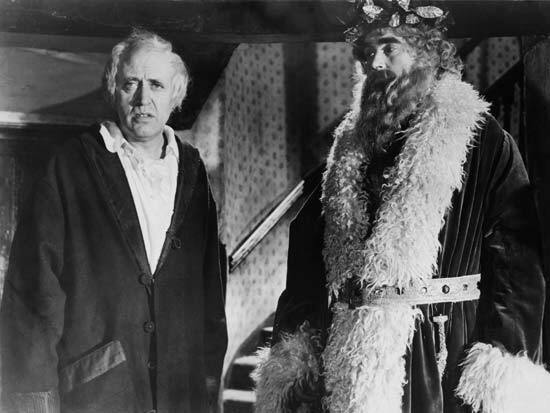 But there is a strong sense in which the image resists the humanizing impulse of the caption, making it hard to see Lantzy as a distinct individual, or quite possibly even as human. Pigeons are an urban nuisance. They are believed to carry communicable diseases and their nesting habits are squalid. Cleaning up after the mess they leave behind can be both costly and dangerous. The homeless are often characterized in similar terms and the photograph here accents the point of identity. 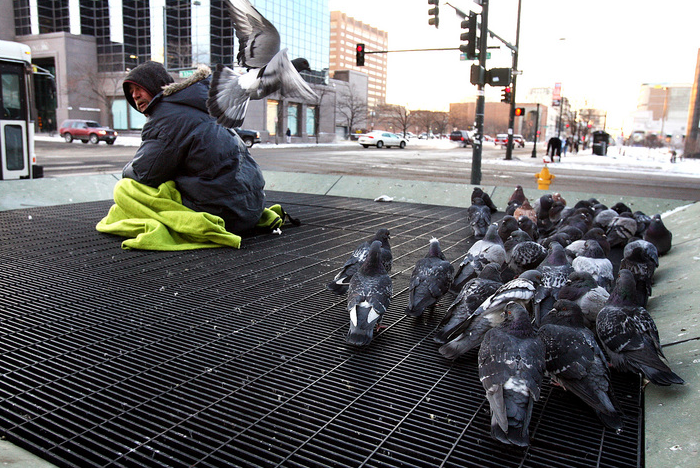 Shot from a slightly elevated angle, it directs the viewers attention downward to the ground where homeless and pigeons alike are obtrusively roosting at the intersection of a public thoroughfare. The oblique angle from which the viewer observes the scene diminishes the difference in size between man and flock, while his gun-metal grey coat blends in almost perfectly with the colors of the birds’ plumage. The overall effect is to accent sameness and to undermine difference, even as it denaturalizes the landscape. This last point is important, for it is unlikely that the average pedestrian would view the scene portrayed here from this vantage as they walk by on their way from one place to the next. The photograph thus frames a somewhat exotic view (as if in a zoo) of the urban landscape. One might be inclined to view the photograph as an ironic comment on a public and communal immorality—treating humans as vermin—but to do so requires us to recognize and acknowledge a clear difference between human and non-human in the picture. To this end, one might point to the lime-green blanket on which the man rests as a sign of a primitive, human instinct, but pigeons (like the homeless) are also notorious scavengers, and so what might function otherwise as a humanizing distinction is weighted down in this photograph by the more pronounced points of animalistic similarity. What is needed to disrupt the zoological analogy is something that gives direct and pronounced access to the man’s soul, a sense of his inner-being, his humanity, that would make it difficult or even impossible for another human to ignore his plight or presence. It is to my own shame that when I encounter a homeless person on the street I will often avert my gaze so as to avoid eye contact—the demand for human recognition—as if to make the “problem” before me disappear. And in this photograph it is notable that we have no access to the man’s eyes (as we have no access to the birds’ eyes) and thus nothing that would demand that we recognize his unique humanity. Just as we anthropomorphize animals by accenting the human quality of their eyes, so we animalize (dehumanize) strangers by erasing (or otherwise “veiling”) the windows to their soul. Animals are conventional photographic subject and a minor but persistent topic of photojournalism. They are quite prominent in Britain–for example, The Guardian photo page includes “This Week in Wildlife” as a regular feature, and the daily slide show often contains additional images as well. In the U.S. there probably is regional variation reflecting geographic and economic differences, but cute pets and tranquil wildlife are standard fare. 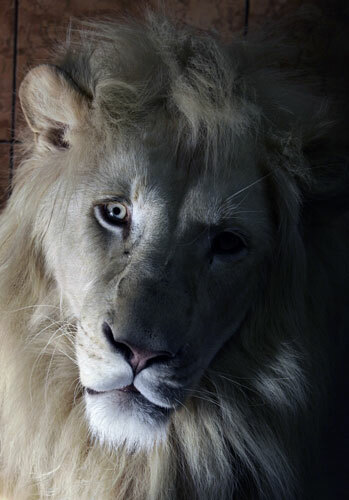 Images of pets and zoo animals often contain anthropomorphic appeal, which is exactly why I find this photograph of a white lion in the Belgrade zoo so disturbing. Penguins splashing in a concrete pool might be happy as clams, but large mammals always appear to be somewhere on a well-worn path to madness. This poor beast could be placed right into one of those paintings of animals playing poker, but for the fact that he looks so sad, at once perplexed and aware of what is happening to him. His intelligence–or emotional intelligence, if you wish–is captured in the brightly lit eye on the left, while the deep shadow on the right side of the photograph suggests that his mind is sliding into darkness. This effect is heightened by how the face appears to twist as it elongates to the nose and mouth. Perhaps but a trick of light, it also is another example of how the photo turns the anthropomorphic impulse against itself. We want to see animals as being like us–curiously, we do this as we make them captive–yet now we are confronted with the thought that they may be sentient and complex and emotional enough to suffer from being confined for our viewing pleasure. I could quit there, but this was a rich week for animal photography. The next shot provides another angle on looking at animals looking at us. This black rhinoceros is kept in the Frankfurt zoo. Again, the photo features the animal’s eye, now one that seems to reflect a duller intelligence, one trapped in a perpetual state of trying to comprehend what he sees. What strikes me is that he seems confined and burdened not by the zoo but by his own body. 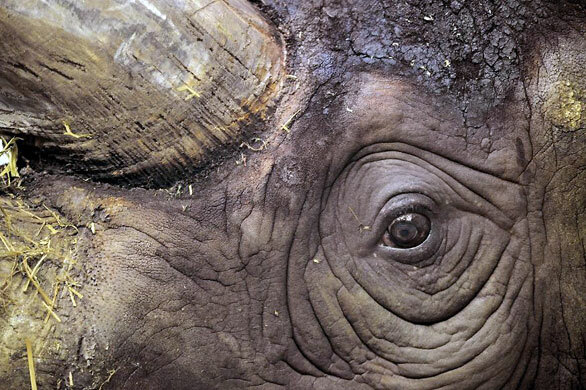 That eye looks out from amidst a huge head weighted with a great mass of horn, part of a massive carcass encased in thick skin, so thick it can become encrusted with mud or mold. That’s a lot to manage, and he seems consumed by the task, so much so that looking at us is almost too much to handle, one more burden for him to carry along with the rest of his bulk. 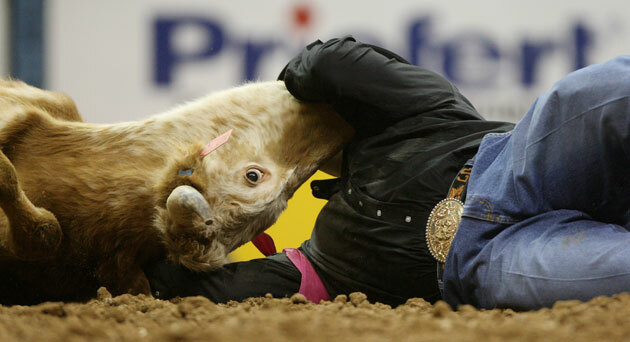 This rodeo steer is the animal eye taken down to its elemental condition of dumb, uncomprehending fear. 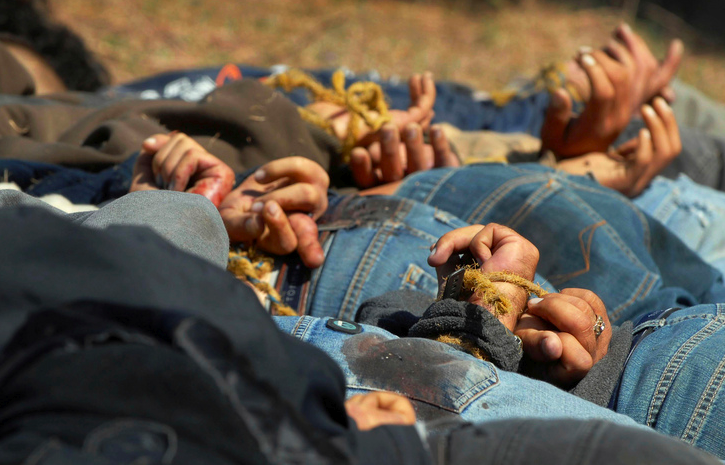 He did not evolve for steer wrestling, and he looks out in terror as he lies there on his back, throat exposed. The image still has a strange anthropomorphic element to it, however, because of the way the two bodies converge. We see only the head of the steer while the wrangler’s body is rendered headless by the angle of the camera. The result is a minotaur. In the Greek myth, he had a man’s body with the head of a bull and lived within a maze. He was fearsome but trapped, confined to the maze like an animal in a zoo. The rodeo minotaur also is a figure of captivity. Steer and cowboy alike are trapped in their roles and in their bodies. Thrown together in order to survive, they may have more in common, and more need of one another, than we like to admit. 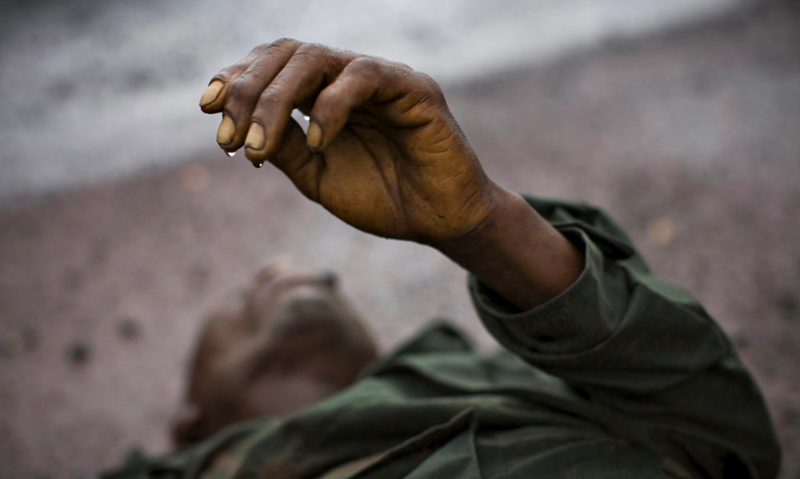 Photographs by Srdjan Ilic/AP Guardian, Frank May/EPA, and Isaac Brekken/AP Guardian. For an earlier post that ends on the animal eye, go here. If you appreciated the reference to the Greek myth, you might enjoy The Minotaur Takes a Cigarette Break. Yesterday Senate Republicans refused to support a bill to aid ailing U.S. auto makers. The New York Times report was accompanied by a photo of concerned pols, but I think this image gets to the heart of the matter. This car dealership in Fort Wayne, Indiana had been vacated when the dealer moved to a new location. The photograph captures far more than the local news. 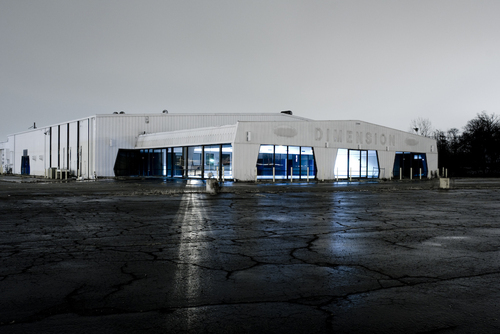 A large, empty shell of building, surrounded by vacant space and cracked asphalt, reflecting pale light and a dull sky–the scene is an allegory of inertia, mismanagement, vanishing markets, and lack of vision. Don’t expect to see it re-opened any time soon. The empty desolation of the photo captures the impact that shuttering the auto industry has on the economy. Each affected community is left with a big hole to fill and no obvious replacement. I have no doubt that the bill, despite being endorsed by both the White House and Congressional Democrats, was not the best solution. I also doubt that the best solution was actually available at this time. Let’s hope a viable agreement can be crafted soon. 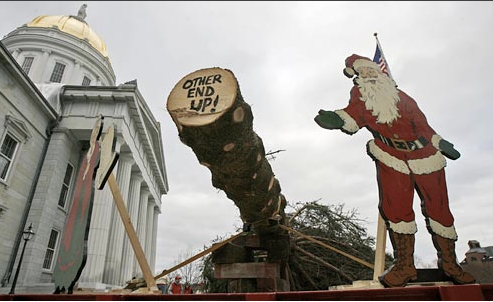 No industry has ever deserved help less, but the Republicans shouldn’t blow up three states and put a hole in the side of the U.S. economy just because this is a good time to lean on the unions. If there is a teachable moment here, it certainly includes several lessons about bad management. It also is yet another demonstration of the danger of minority rule. The Senate requirement of 60 votes for significant legislation seriously hampers the ability of the U.S. government to respond to important problems. The Senate Republicans can lecture the unions all the want, but their use of the supermajority rule exemplifies an inability to respond effectively to change–exactly the attitude that led the auto industry to their sorry state. The public performance of contrition is a puritanical art form—think of Bill Clinton’s multiple attempts to seek public forgiveness—that demands careful attention to a subtle and nuanced civic republicanism that negotiates the tension between individual humility and the capacity and resolve to do better. One has to be both abject and majestic; totally subject to sovereign forces and yet capable of forging a virtuous path into the wilderness of the future. It is not yet clear that the heads of the auto industry have entirely mastered the role, though the warm color temperature of the above photograph, as well as the one that followed it in the NYT slide show seems to signal some hope. 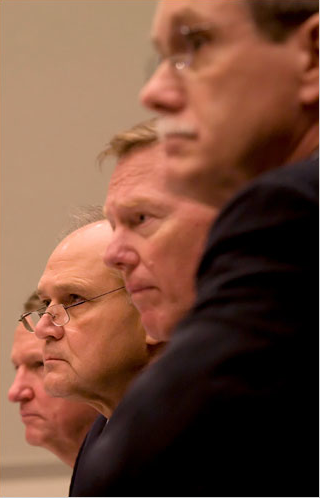 Cast in a cascading portrait that emphasizes file and not rank, their lips tightly pursed, their eyes riveted in unison upon the source of power and absolution—the duly representative agents of a sovereign “people”—the photograph offers the viewer the statuesque countenance of humble, virtuous men—the elect Captains of Industry—who understand the gravity of their past human failings, and yet nevertheless are eager to take on the responsibility to get the job done right. Robert Nardeli’s eyeglasses are especially notable in this regard. Symbols of human frailty, they sit low on the Chrysler CEO’s nose, allowing him simultaneously to see through them (to the immediate economic problem that sits in front of him) and over them (to the arbiters of the public trust). Surely no less will be needed if the crisis is to be averted and the public’s faith is to be sustained. But even as the second photograph above inflects the first, framing the act of contrition in the context of a traditional and stylized civic virtue, so too the very next photograph to appear in the slide show seems to inflect the first two photographs. Here again we see the performance of an act of contrition, but the affect is altogether different: more farce than tragedy. The penitent is immediately recognizable, not just because his body is whole (in contrast to the fragmented bodies portrayed in the first two photographs), but also because of his celebrity and notoriety. 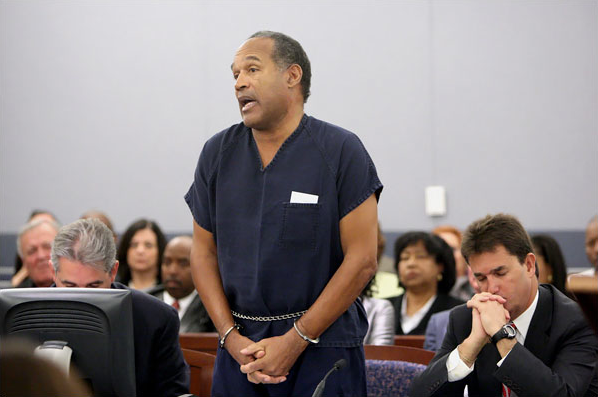 Having previously and arrogantly (if ambiguously) admitted to a dastardly crime for which he had been acquitted, here he seeks the mercy of the court by apologizing for his most recent “stupidity” by casting his crime as a “foolish mistake.” The actual performance proved to be unconvincing to the judge, who sentenced the defendant to a minimum of nine years in prison with a 33 year maximum, but it is the photographic performance that bears special significance. 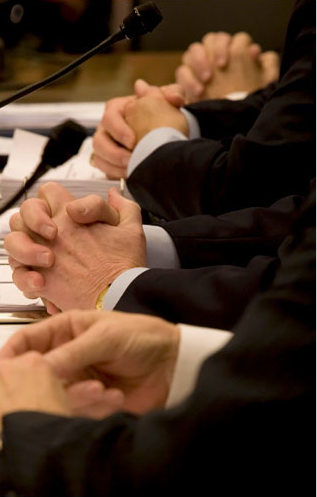 The success of public acts of contrition rely upon a modicum of belief that the “sinner” can rise above his or her human failings—or at the very least that a commitment to live up to the public’s faith will be treated with gravity and responsibility. In this regard, there may be no greater crime than the arrogant disregard of the public trust. And when such arrogance rears its head a second time, the warm tones that give the first two photographs their special cast and resonate with a hopeful future give way to the cold, harsh tones of reality evident in the last photograph. 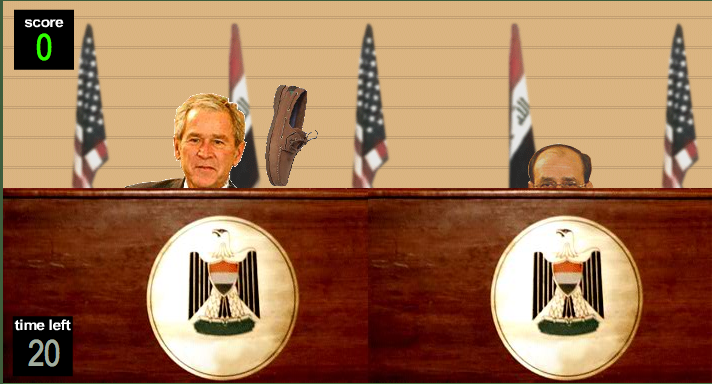 Here, the body, no longer fragmented in terms of the mechanisms of human agency (hands and head) is intact, but more importantly, it also constrained and disciplined by both the instruments of the state (the shackles) and public opprobrium (evidenced by the expressions on the faces of the citizens sitting in the courtroom). Scorned once, the photograph seems to caution, the people look on subsequent acts of contrition with profound skepticism. And, we might add, as well they should. Thus, it can be easy to dismiss him, except for that hand. There is something achingly beautiful about it. It seems so alive, or if we know otherwise, so etched with life. It is a particular hand, not the abstract symbol of labor, but the hand of an individual whose lifetime of experiences, however common, were encountered with all the particularity evident in each crease of skin, the line of each cuticle, the smudge of dirt. More than that, the image evokes all the skill of a hand, its capability for craft and communication. Caught in a last gesture, this hand seems to still want to communicate, to reach out or up, to plead, perhaps, or to touch and say goodbye. Update: Thanks to Michael Shaw for the double post at BAGnewsNotes, where you can read additional comments by readers there. Sight Gag: "Fox News Update! 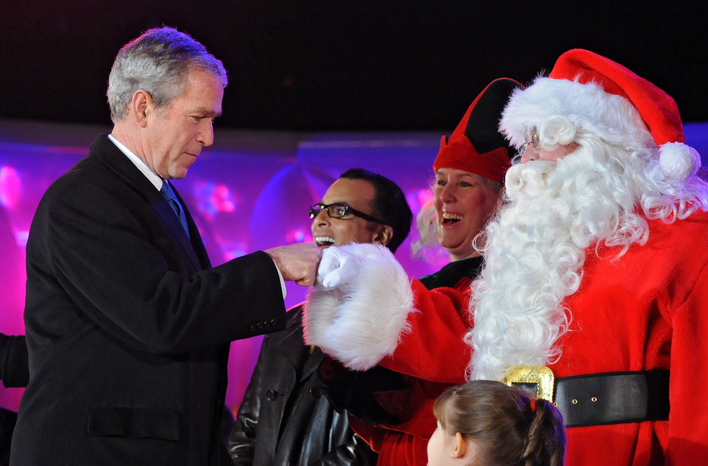 Santa Claus Photographed Engaging in Terrorist Fist Bump!"